For the sake of this lesson, let’s say your game just became unbalanced – A new update launches a new character. Suddenly, it seems out of balance as most players solely play said new character. 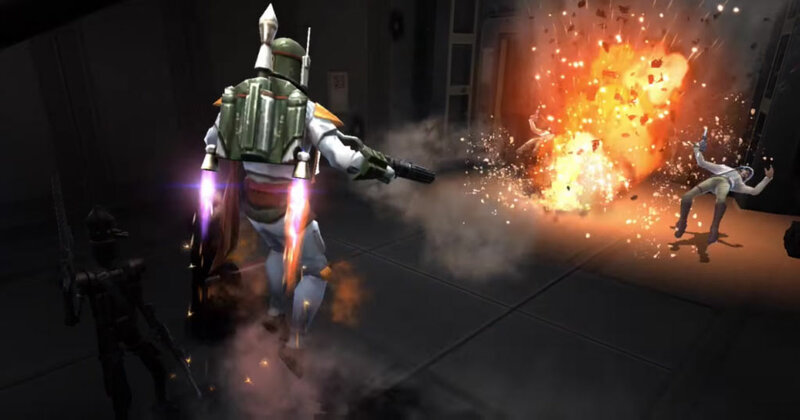 Soon enough, some players shift towards counter-strategies in order to maximize their odds against this “flavor of the month.” After a while, you take note of the player feedback and subsequently nerf the offender–often to oblivion–leaving room for a new character to take its place as the leading cause of strife. An update is released that introduces, or boosts, an existing character/card, making it stronger than average. Expert players build strategies around “patient zero”, which become trends in top-tier competition, which gradually become mainstream. Top-level competitors build strategies to counter the now widespread “patient zero”. Counter characters/decks become more common. Counter-strategies are built against the now more common counter character, diversifying the meta-game. (Ripple effect). The meta-game stabilizes with a limited set of characters/decks used widely. Developers nerf “patient zero”, greatly reducing its potency. This simultaneously diminishes the value of the counter-meta and all other ripple strategies. Balance update or new content creates a new flavor of the month. Why is this scenario so common? Why do game giants — that have years of development experience with tens of million players, such as Blizzard — seem to struggle so much with their balance? The answer is simple: keeping a controlled imbalance within a game is good for the health of a meta-game, and can also be a very lucrative business strategy. Here’s why this cycle works. It increases engagement as it forces players to diversify their play-style and explore different types of gameplay in order to keep up with the meta-game. In competitive games such as Hearthstone or Heroes of the Storm, a stale meta would mean a player-base that is content with what they currently have. If the player’s current roster of characters or cards never spoils, you’ve lost future engagement on old stock. Being suddenly at a disadvantage against others due to a shift in the meta-game may push players outside of their comfort zone and force them to use other strategies. This may also cause players to learn more about the game, making them explore and enjoy more content than they would have if otherwise left to their comforts/favorites. It increases monetization potential. Every time a new strategy becomes mainstream, it creates new aspirations, driving sales. For each counter-strategy or ripple, additional sales opportunities are created, and this provides new value to older stock such as characters or card packs, making them valuable purchases once more. When sales fall due to players owning a good part of the current meta-game’s characters or cards, the cycle (of nerf/balance) can be renewed to bolster sales by shifting that meta. A game can’t ever be truly balanced, can it? Players should be able to build their own meta-game without outside influence, right? This is partially true. However, the meta-game will likely stall much faster, and will not produce as many benefits, if it is strictly user-driven. Developers know which characters/cards are not often used (thus, not a significant spending option for players). 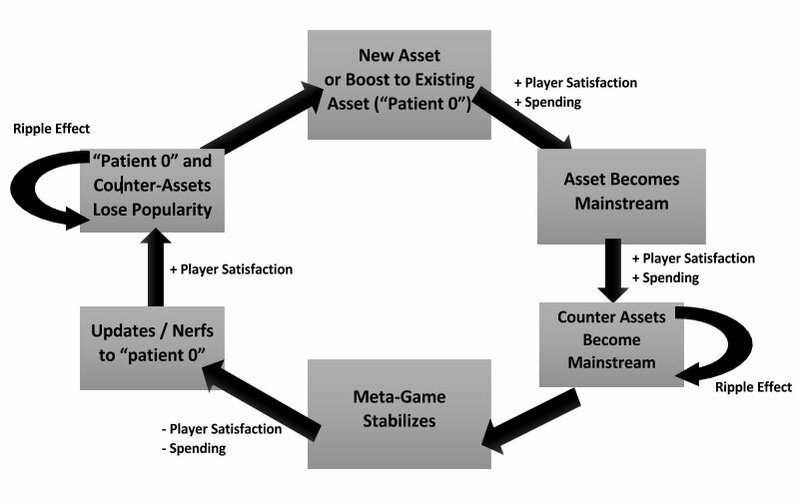 By focusing on the less lucrative parts of the game, developers can maximize initial profits and lengthen the time required before the meta-game stabilizes and stales. Beyond that, they can also revive dead aspects of their game. Financial benefits aside, no one wants to watch something they’ve created wither, and reinvigorating the relevance of an older character or card can feel extremely gratifying. At times, imbalance can be as essential as balance. At least one efficient counter must exist for “patient zero” in order for the meta-game to create as many ripples as possible. Initial play-tests must define a counter-strategy early on. Community management must be engaged and knowledgeable. You want your players to be heard and you want to take their pulse as often, and as thoroughly, as possible. If the community feels frustrated by “patient zero” you will likely receive positive feedback from a nerf. In many cases, a pre-planned nerf will feel better to a fan-base if it seems that they informed it. You must wait until the meta-game has stabilized sufficiently before making any reactionary changes – this way, you both maximize profit and minimize the risk of frustrating players who have just spent money in order to adapt or adopt this meta. It has been proven, time and time again, that building a successful meta-game is not necessarily about simply making a balanced game. On the contrary, it’s about making the right imbalance and counter-balance at the right time, tipping the weights on your scale just enough to create movement, thus keeping your game fresh and healthy. Your meta-game should be dynamic, living, and lucrative. Most importantly, it is a tool used to constantly reinvigorate your game and stave off the dreaded stall.